Seán Canney TD has reiterated the importance of the Western Rail Corridor for the future development of the West of Ireland. ‘Phase 1 of the Western Rail Corridor has exceeded the projected level of use with 279,000 passengers using the Galway to Limerick line in 2015 as confirmed by Irish Rail. Phase 1 serves the towns between Galway and Limerick including Athenry, Craughwell, Ardrahan, Gort and Ennis. ‘I have always advocated for the extension of the Western Rail Corridor north from Athenry to Tuam and Claremorris. 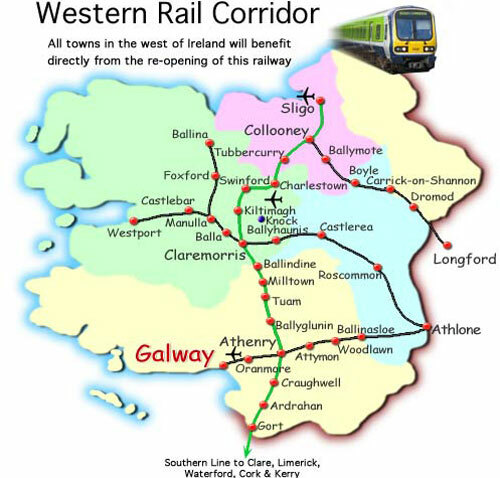 This development would provide rail connectivity from Galway to Westport and Ballina, Galway to Limerick as well as the existing Galway to Dublin line. The opening of the Western Rail Corridor would provide direct rail freight access along the West to Foynes Port in Limerick and Waterford Port. ‘The Programme for Partnership Government recognises the importance of the railway to the future development of the West of Ireland as a counterbalance to overdevelopment in the greater Dublin region. ‘The Atlantic Economic Corridor is the platform to create balanced development and the Chambers of Commerce of Limerick, Shannon, Ennis, Galway, Roscommon, Mayo, Sligo and the American Chamber of Commerce support this drive for balanced development. ‘All political parties believe in the concept of the Atlantic Economic Corridor and they need to put this into operation in their utterances and they need to give clarity instead of playing politics. ‘The Western Rail Corridor is a vital component in the realisation of this vision. The re-opening of the Western Rail Corridor Phase 2 & 3 will revitalise towns in Galway such as Tuam, Milltown, Athenry, Ardrahan, Gort and Craughwell. ‘The fact that the NTA spent €270 million in projects between January 2015 and March 2017 in Dublin and spent €25,000 in the rest of the country demonstrates clearly the imbalance that continues to exist. ‘We need to unite and aspire to bigger investment for Tuam, Athenry, Loughrea and Gort. We should not be afraid to flight for more. We have got to stop putting ourselves down. Finally, we need to work together in the West to ensure we get infrastructure lead development for the entire region. Mayo Towns are showing the way in the development of community greenways. Castlebar and Claremorris now have two excellent facilities which are being widely used by local communities and visitors. The development of such Community Greenways is best facilitated by identifying attractive local areas of natural beauty such as lakes, woods or rivers which can be adapted for use, as in the case of Lough Lannagh in Castlebar or of Clare Lake in Claremorris, developed with the support of Mayo County Council. A children’s feature ‘The Land of the Giants’ has been built into the forest section. The lakeside in a wooded setting features sculpture, seating, bridges, a gazebo and much wildlife, including ducks, geese and butterflies. Boating and fishing facilities are provided and a fully-equipped children’s playground has also been developed at the entrance. More than 2,000 people now use the facility every week. 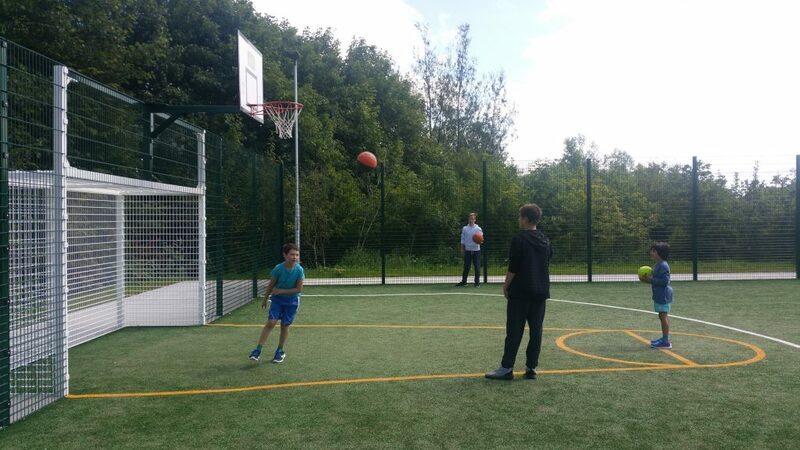 The latest addition is a multi-use gaming area with an astro-turf facility, basketball and goal posts. The project has been developed over time by a number of community groups with assistance from Mayo Co. Council. A further 2.5 Km is now to be added taking in another local lake, again with the support of the Co. Council. While the park is located in the vicinity of the Mayo-Galway railway line there is NO interference of any kind with the rail infrastructure. The Lough Lannnagh greenway at Castlebar is a 10km trail offering a pleasant mix of countryside, including fields, riverside woodlands, small sections of quiet country back roads and urban settings. The Greenway forms part of the National Cycle Network which is currently being developed throughout Ireland. This facility is designed for shared use for leisure walkers, joggers and cyclists. 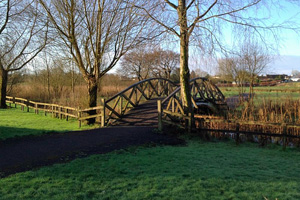 Funding of €725,000 was made available from the Department of Transport, Tourism and Sport under the National Cycle Network Programme to develop the Greenway from Springfield, Castlebar to the National Museum and Mayo County Council also provided match funding to the same amount for the urban section of Greenway from Lough Lannagh – Springfield. The route is mainly traffic-free and off- road with a solid surface, consisting of both tarred and compacted gravel. The Greenway was designed and developed by Mayo County Council by way of Permissive Access in partnership with 28 local landowners. These models offer an exciting template for similar towns seeking to develop community greenways, leaving important regional infrastructure such as railways protected for future development. 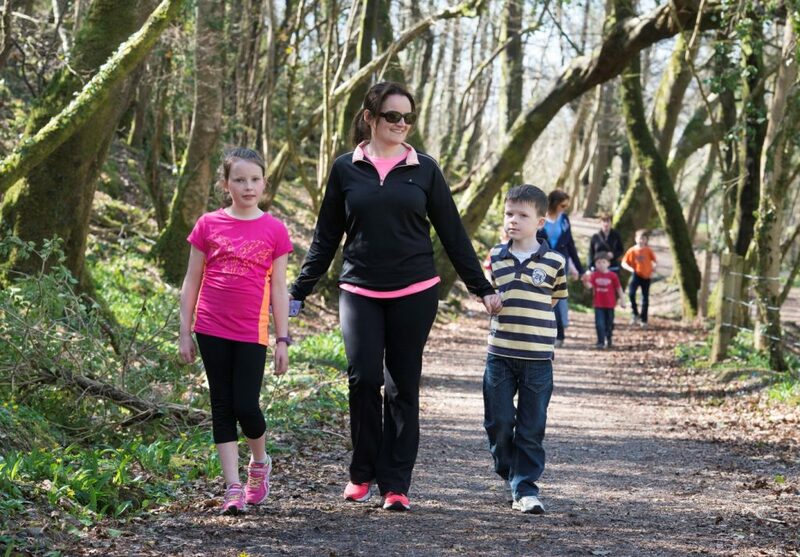 Pictured: Family stroll at Lough Lannagh Greenway. Pictured above: (L-R), Seán Canney TD, Cllr Richard Finn, Cathaoirleach, Mayo Co. Council and Cllr Michael Connolly, Chair of the Western Inter-County Rail committee. The new Cathaoirleach of Mayo Co. Council, Cllr. 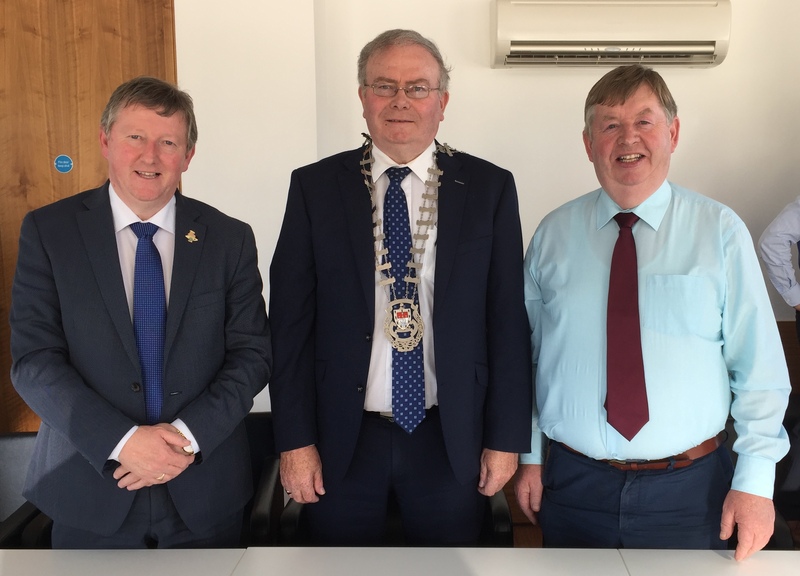 Richard Finn, has reiterated his full support for the restoration of freight and passenger services on the western rail corridor, beginning with the restoration of the Mayo-Galway rail link and called for the rail infrastructure to be protected for that purpose. Addressing a meeting of the Western Inter-County Rail committee in Claremorris, attended by councillors from across the region Cllr. Finn told members that the provision of key infrastructure was critical to the development of the west and north-west and key to any medium or long-term programme such as the Atlantic Economic Corridor plan. “As well as targeted local investment we now also need to look at the big picture across the regions. Galway is our regional capital, yet the rail link from Mayo to Galway (and to Limerick, Cork and Waterford) remains unused. As a result, rail passenger services are being denied to the large numbers of people travelling daily between Galway and Mayo while rail freight services, which are a critical element of enterprise and job creation in County Mayo, are being denied direct access to the port of Waterford and to Foynes when it reopens. In the coming post-Brexit environment this link will be even more crucial allowing our exports to reach Europe directly without twice encountering the planned barriers in the UK. Stressing the need for the protection of the railway for future development, Cllr. Finn said the continued disuse of the railway was not sustainable either from an environmental or economic perspective. “It would be extremely unwise to allow this key infrastructure to be ripped up and replaced with a bicycle track or greenway when there are numerous other options available for such tracks. Members will note that Mayo Co. Council is actively protecting the railway in line with the County Development Plan and the Regional Planning Guidelines while at the same time developing an ambitious programme of greenways in areas of high visual amenity. This is the way forward and will ensure that we retain our railway while developing other tourist attractions,” he concluded.